Over the years we've collected a bunch of videos with sound from all over the world. The following videos are in WMV format and you will need Window's Media Player to play them. Just click on the picture or the underlined title to run the clip. 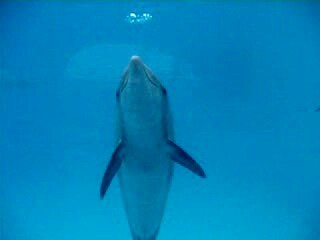 Video #1 - "Bubble Rings" A young bottlenose dolphin having fun blowing a "bubble ring." This is a self taught behavior. He learned it from watching other older animals and mimicking their behavior. This group of dolphins often seem to use the behavior to illicit a response from the public watching through the windows. Sometimes it's hard to figure out who's training whom. Video #2 - "See Food" A young male walrus enjoying some "see" food. This walrus really likes getting a reaction from the guests. One of his favorite methods is to hold food in his mouth and show it to the folks a few times before he eats it. This behavior is not trained but it is self reinforcing. He figured it out on his own and keeps doing it because he gets a positive response from the people watching him. 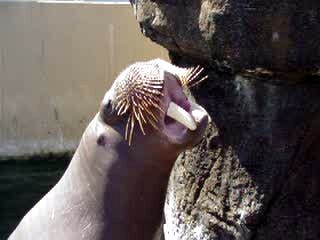 Video #3 - "Walrus Roar" A young male walrus demonstrates one of his many natural vocalizations. By training the animals to vocalize on cue, the trainers can demonstrate these sounds to guests and other people who may otherwise never hear such sounds. In addition, scientists can reliably record and analyze the different vocal patterns. Vocalizations from this group of walruses were recorded and used for some of the dinosaur sounds in the "Jurassic Park" movies. 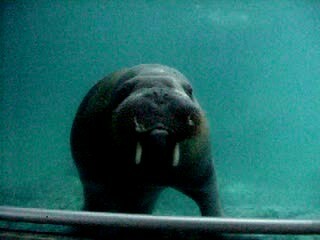 This young male walrus starred as "Jocko" in the movie "50 First Dates." Courtesy of Six Flags Marine World. 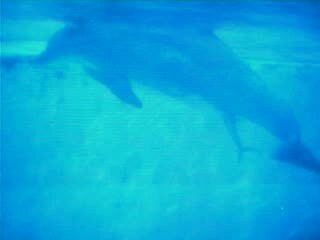 Video #4 - "Dolphin Birth" The actual birth of a baby bottlenose dolphin (Tursiops truncatus). Here is a short clip from a rare video taken during the actual birth of a baby dolphin (Tursiops truncatus). The birth occurred just before dawn with very little available light, so the images are a little dark and the resolution is a bit grainy, but the process is quite clear. For more pictures and information on this topic, please see our Dolphin Birth page.